There's nothing like a fresh snow storm the night before to set off a movie premiere. After the Wasatch Mountain received a fresh coating of white stuff everyone was ready for some skiing action. 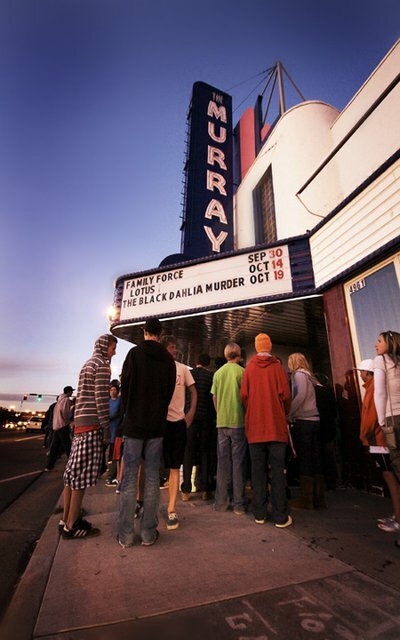 Crowds gathered outside the doors of the Murray Theater an hour before the doors where even opened. 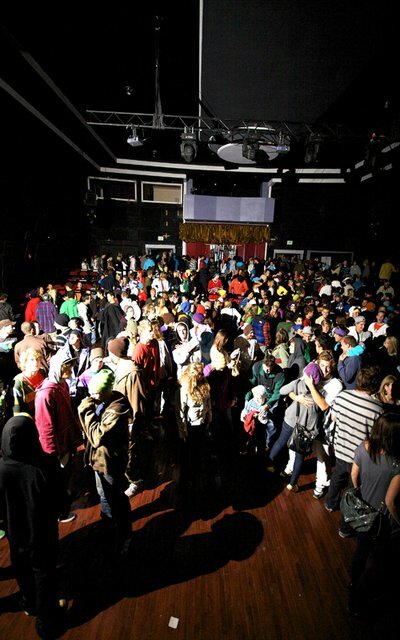 Once the doors where opened mobs of people gathered in, cash in hand and ready to witness two epic movies from 4bi9 Media and Level 1 Productions. 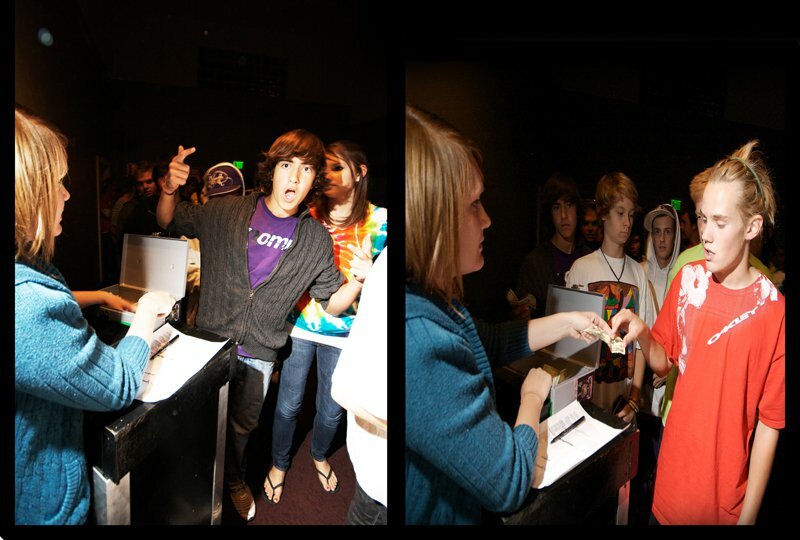 Once you entered the theater there was a table to get yourself an autographed poster. 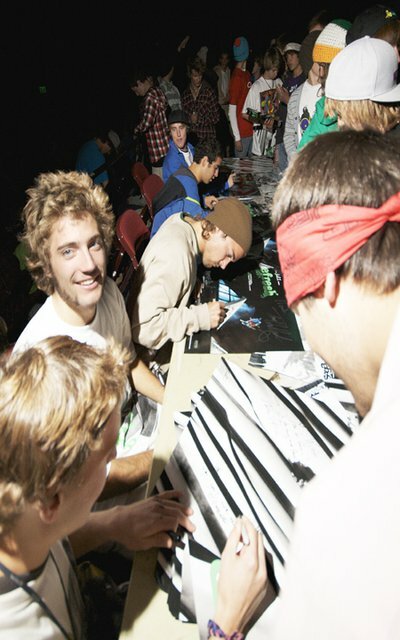 Tom Wallisch, Ahmet Dadali, Wiley Miller, Steve Stepp, and Ryan Wyble were getting down on the signing. Ahmet Dadali, Wiley Miller and Ryan Wyble. One beautiful fan enjoying her poster. 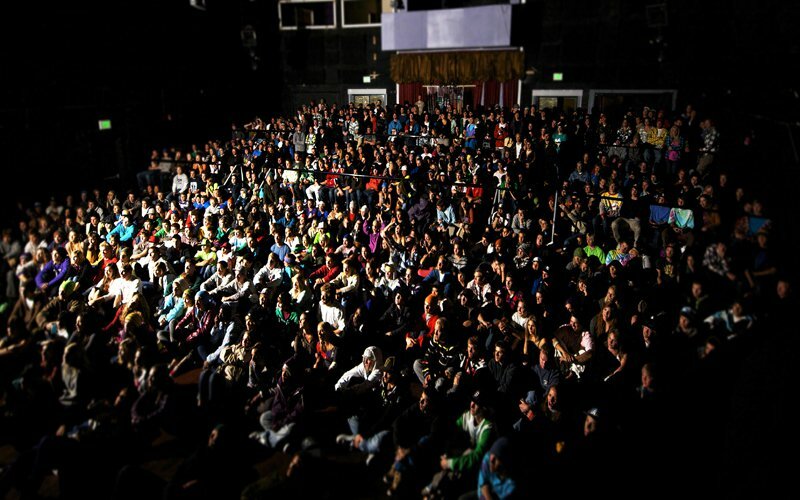 With only a limited number of actual seats in the theater crowds gathered to the floor, or crowded in the back. Ryan Wyble and Steve Stepp Livin' it up before the premier. 4bi-Crew was out to start off the night with a bang. 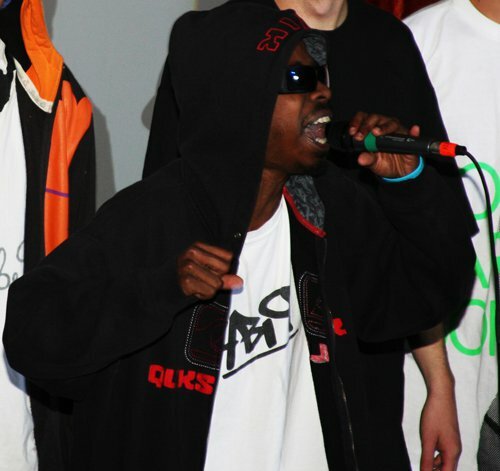 A member of 4bi9, Roy, hyped up the crowd with some ill rhymes to get the night started off right, and before you knew it 4bi9 media's premier of &quot;So Far So Hood&quot; was underway. This being 4bi9 Media's third feature length film, AJ and crew absolutely killed it. The soundtrack was on point to back up some epic skiing from the likes of Steve Stepp, Witt Foster, Tom Wallisch, Collin Collins, Henrik Harlaut and many others. This movie has it all, from some of the most progressive park skiing today from Tom Wallisch, to beautiful powder lines by Witt &quot;The Cat&quot; Foster, So Far So Hood&quot;was money. 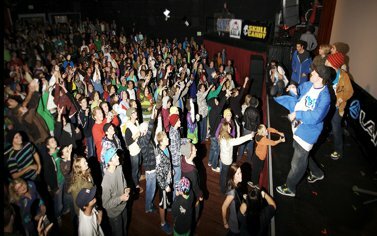 The crowd was pumped up, and the vibe was off the hook. If you haven't seen the movie I highly suggest you do. Order you copy now at http://www.4bi9media.com. During a short intermission Emcee of the night Freedle Coty raffled away a bunch of awesome prizes. From Skullcandy headphones to Under Armour outerwear, the sponsors definitely hooked it up with a whole bunch of product. 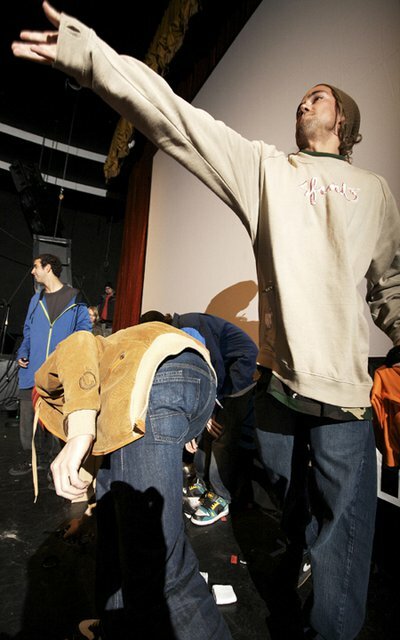 For the big prize of the night a brand new pair of Dynastar Skis went to the winner of a &quot;Simon-Says&quot; push-up contest. Emcee of the night Freedle Coty along with Schui, the Level 1 Intern. 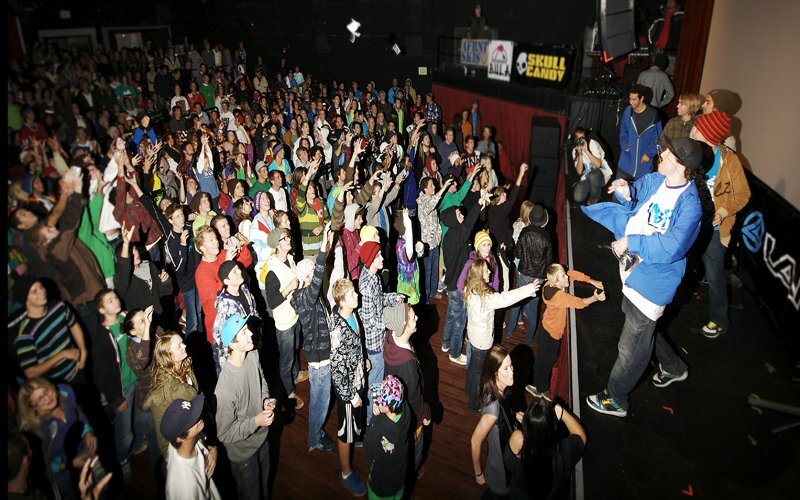 The Level 1 crew got involved with a little product toss, generously provided once again by the sponsors. 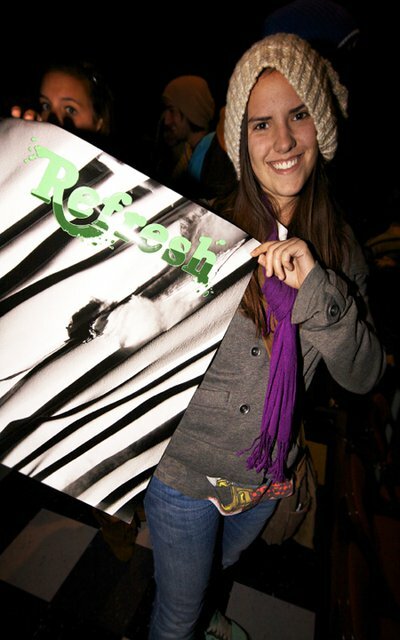 As the crowd began to roar, Level 1 Productions presented Refresh. To say I was blown away by this movie would be an understatement. 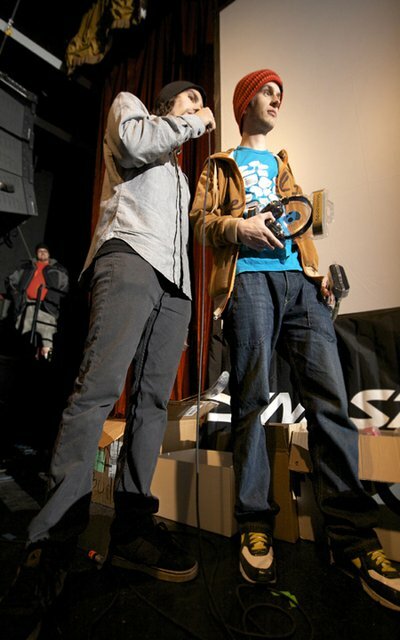 It was the most well thought out production of a ski movie to date. Anyone who is a skier knows Warren Miller's voice, and once you hear his voice you know there is going to be some epic shredding. The skiing in this movie is unbelievable. Some of the top athletes in our sport pushing the level of skiing every time they step out to shred. Tom Wallisch, Mike Hornbeck, Ahmet Dadali, Will Wesson, Henrik Harlaut all destroy the park and urban scene, while Stefan Thomas, Duncan Adams, and Wiley Miller tear the big mountain apart. This movie perfectly describes skiing as a whole, not just one side or the other, as it showcases all the diversity of park skiing and big mountain skiing together. I'm going to claim that this is one of my favorite ski movies I have seen to date. 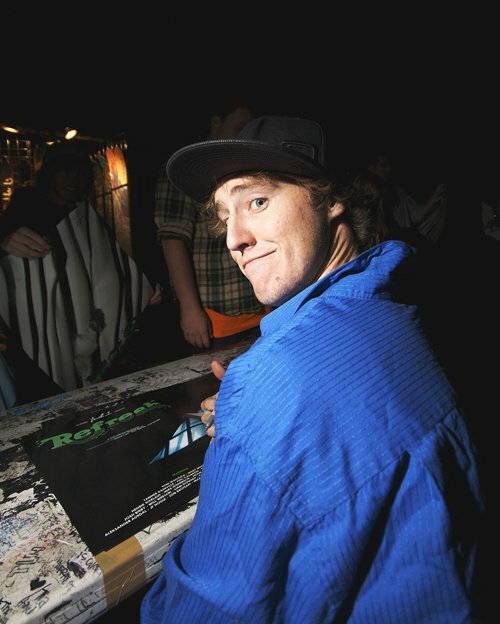 Big ups to Josh Berman, everyone else at Level 1 Productions, and Warren Miller. Everyone should see this movie. Reserve your copy at http://www.level1productions.com. Big thanks to all of the sponsors: Spyder, Dynastar/Lange, Skullcandy, Jiberish, Kombi, Under Armour, Moment, Amplid, Volkl and Spy. Newschoolers.com also wants to give a huge shout out to Josh Berman, who got married yesterday to his longtime girlfriend Lindsey. Congratulations you guys! The Level 1 SuperUnknown Finalists will be releasing over the course of this week and first two are out now. This article will continually update as the edits drop.